(08-24-2018 09:46 AM)epasnoopy Wrote: Kind of sad when a kid rather go to Iowa State than NIU. We should be beating out low-tier P5 schools for recruits and not 1-AA schools. Not that I care about Iowa State, but after last season there is some good hype for Iowa State. Their RB is a stud and overall team is trending up. Now you say a school like Kansas or especially Rutgers that is different. We've lost recruits to Kansas and Rutgers too. All I'm saying is if all we can do is beat out 1-AA schools for recruits then Carey better start becoming a better coach. Lol seriously? You turned this into being Carey's fault? Wow. Hmm I wonder what these kids will choose between the two. Carey is the head coach of the program and its him and his staff that do the recruiting. Whose fault is it if we can only beat 1-AA schools for recruits? While Iowa State may play top tier schools they often lose to those top schools. If you haven't seen Iowa State traditionally at the bottom of the Big 12 with Kansas then you haven't been following college football. I can't understand either. Especially when the fans show so much support for the coach. Carey is nowhere near the level of coach as Kill, Doeren, and Novak. If he was any good he would have been scooped up by a P5 school already. The biggest miss is at QB. If Childers isn't it he has to find someone else, quickly. After watching Chandler Harnish and Jordan Lynch put up ridiculous stats and getting Heismam hype under Kill and Doeren's offenses talented quarterbacks should have been salivating to play at NIU. Carey didn't capitalize on all that success. Drew Hare had some talent but injuries did him in. Anthony Maddie looked good in limited time. Carey playing Ryan Graham over Maddie in 2016 and Santa in 2017 just screams poor decision. This has been your regularly scheduled tangent... now back to 2019 Official Verbal Thread. Disagree because of the nature of the position. There are far fewer top rated qbs than other positions. I think there is only one 5 star and twenty-thirty 4 star for 2019. So the bigger schools swoop up plenty the 3 star kids. Getting a QB is a lot of luck. Top programs fail year after year even with the 4 and 5 star kids. NIU got lucky with Harnish. No one else wanted him. NIU did not recruit Lynch. 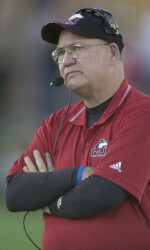 Lynch came to NIU via his HS coach getting him in. And in 2014 Carey landed the highest rated qb NIU has ever signed in Landon Root. He bombed out and never made it here. But that’s why qb is a crap shoot. Regardless of Lynch and Harnish success, NIU is stIll NIU. That’s the myth of the 2010-2013 success here. That kids should be dying to come here. Just not true. That’s all in the heads of Huskie fans. (08-24-2018 04:19 PM)HUSKIEFOOTBALLFAN Wrote: I can't understand either. Especially when the fans show so much support for the coach. How about the highly touted dual threat Wisconsin QB who flipped a couple of days before signing day. Wisconsin poached him from us then had him play Fullback. How can you expect our coaches to deal with these circumstances especially when they have players decommit a day before signing day. (08-24-2018 05:59 PM)epasnoopy Wrote: Carey is nowhere near the level of coach as Kill, Doeren, and Novak. If he was any good he would have been scooped up by a P5 school already. That was Alec Ingold in 2015 I think. He was the closest thing to a next Lynch. But that was back to back years of your top qb recruit backing out last second. Between those recruits bailing on NIU and the injuries to all the active abs, it was a really rough period to get through. It feels like we're finally through all that. We will see. I think the position is being restocked nicely now and the total team direction is pointing up. Landon Root was the best QB ever recruited by Carey? The recruiting sites say that he was only offered by Harvard and Tulsa. He must not have been that good of a QB if he only had one other 1-A offer. Carey chose to play Graham over better QBs like Maddie and Santa. We haven't seen a good QB developed during his entire time here. I'd stop passing the buck. Carey is the head coach and this is his program. He needs to produce or be shown the door. How good of a qb could Harnish and Lynch be with zero offers outside of NIU? Root was a .8288 rating. No qb signed by NIU since ratings started in 2001 was higher than that. When did Drew Hare develope? All in 2012 as a redshirt? By the way, Hare had zero offers outside of NIU. How good could he be? Carey screwed up with Maddie. But Maddie was a pretty poor passer and such an excellent runner he tried to get him on the field while Hare was going to be the qb. After Hare got hurt, Graham only started over Maddie once. SanDiego State. The next game they split and after that Maddie Took over. Santa, you have no idea what he is or who he should play over. But add it all up...you lose your two high recruits at the last second in back to back years. Your #1 goes down in back to back years and your #2 goes down. Your choice is then Graham, Santa or Childers. Pick your poison. He is to blame for a couple of bad choices he’s made. But that’s a sh*t sandwich to deal with. Tyrik Henderson, 3* db has committed to the Huskies. Believe he decommitted from Minnesota before the season and transferred to St. Thomas More in Connecticut to finish his HS career. this is a big get for NIU. (11-26-2018 11:05 PM)NIUSAE Wrote: Tyrik Henderson, 3* db has committed to the Huskies. Believe he decommitted from Minnesota before the season and transferred to St. Thomas More in Connecticut to finish his HS career. this is a big get for NIU. Great get. He was originally at Glenbard north who seems to have a player or two every year and haven’t landed any. Might have a chance to play as a freshman. Sounds like a big get! Not sure of the circumstances on his decommitmemt from Minnesota, but he had a ton of offers before that. Iowa, Iowa State, Indiana, Missouri, Purdue, to name a few. I believe this is the highest rated recruit we will have ever signed. He is a high 3* 5.7 on Rivals with many legitimate offers. Might have some other big signings in the future as well. 247 has 3 star Defensive end Tre Huntley (0.857) from Lakeland, FL showing serious interest in NIU. Also local kid from Nazareth 3 star RB Michael Love has recently shown interest as well as 3 star WR Tyrone Broden from West Bloomfield, MI. These would be big signings. Ryan Diem came out of Glenbard North. I know a Father of a Naz running back, Strongs (who scored the first TD in the Championship game), and he thinks that Love, who decommitted from BG, might have bigger offers. Love's brother plays for ND.